Windows Live Writer is a excellent blogging tool, sorry essential blogging tool! Although as I have mentioned before, it sometimes needs a couple of additional features to match your business needs. 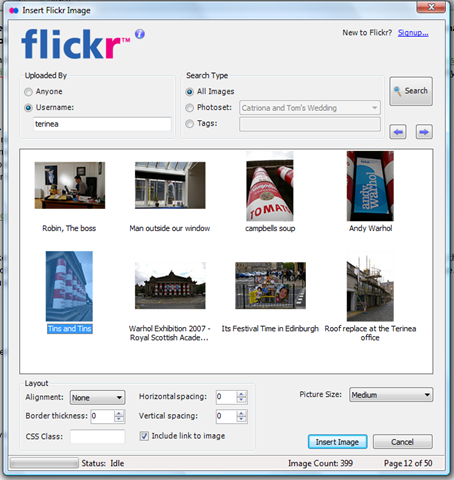 For example, an easy way to insert photos from your flickr account. Clients must despair with people like myself, i.e. advising businesses on new technology. I advise them on something like blogging as a business tool, introduce them to tools such as Windows Live Writer to make the whole process easier. People can view all your photos in one central place. Community can leave comments, suggest tags or leave annotated notes. Gives you another shop window to expose your business/brand. Photos have tags and can be placed in albums (sets and collections) to make navigating around the gallery easier. If the people enjoy your photos or want to know more they will visit your profile, where they can visit your website. You can easily* integrate your flickr photos with your blog posts. Some of our pervious posts on flickr are flickr Marketing, How to use Flickr For Your Business – PowerPoint Slides and Why We Have A Company Flickr Account. Take for example Bill of The Well Tempered Clavier, who has just got his head around the whole blogging thing. Last week I advise him to get a flickr account to upload photos of his green shirt and book signing events. No problem, Bill used Flickr’s uploader tool which makes the whole process a breeze. Then, Bill rang me this week to see if he could insert a photo from his flickr account straight into Windows Live Writer. Without messing around with web browsers, copying and pasting, there isn’t a simple process. Unless you install Flickr4Writer extension! Restart Windows Live Writer if you have it running. Place the cursor where you would like the image inserting. 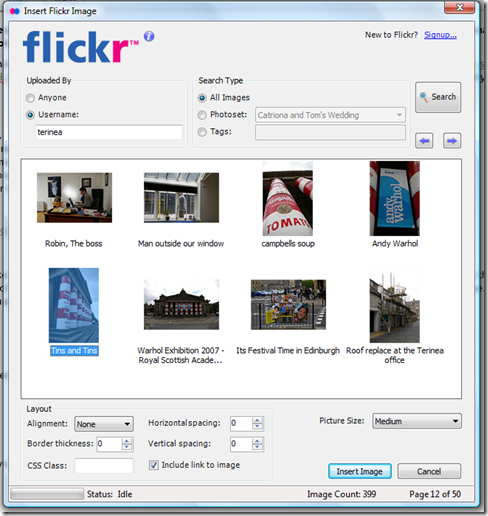 Click on Insert > Flickr Image from the top drop down menu or from the right hand task menu. Enter your flickr username and click on Search. Once the first images have loaded you can then choose the options from Search Type to narrow down your results. Use the left and right arrows underneath the Search button to flick through your photos. Once you have found the photo select the Picture Size and any Layout preferences. Click on Insert Image. What additional features would you like to see in blogging tools such as Windows Live Writer?